Mark your calendars: the 2016 Show is Saturday, April 23! The only fundraiser JMG students do each year is at the Sevier County Fairgrounds in April. 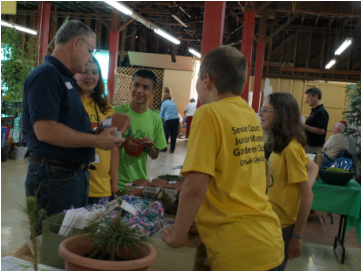 For months the students propagate, transplant, and grow plants in the Master Gardener greenhouse that will be sold here. They make unique items that will be also be sold. Students work the booth with all proceeds going for that years' camp. They also help with FREE children's activities in the Kids' Room, and give tours of the demonstration garden, The Teaching Patch.